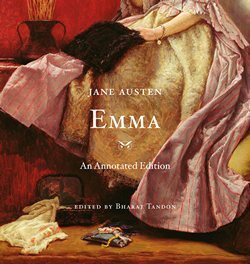 Preview of Emma: An Annotated Edition, by Jane Austen, edited by Bharat Tandon & Giveaway! Holiday book giving is just around the corner, and top on my list to many of my Janeite friends will be Harvard University’s new annotated edition of Jane Austen’s Emma. It will be officially released tomorrow, so mark your calendars and wait for the fireworks. I was agog over their two previous volumes, Pride and Prejudice and Persuasion, so when the next in their publishing quest to bring all of Jane Austen’s six major novels to us in sumptuously illustrated and enlightened editions arrived on my doorstep, I needed my aromatic vinegars to revive myself. Filled with hundreds of side notes and over 119 color illustrations, this new volume is the heavy weight of the set at four pounds and 576 pages. Wow! Emma Woodhouse is one of the most endearing and exasperating figures in fiction – “handsome, clever, and rich, with a comfortable home and happy disposition,” yet often frivolous, inconsiderate, and carelessly manipulative. Now her stubbornness, vanity, cleverness, and independence can be more fully understood thanks to Emma: An Annotated Edition (The Belknap Press of Harvard University Press; September 17, 2012; $35.00), edited by Bharat Tandon. Like the previous volumes in Harvard’s celebrated annotated Austen series, this is a beautiful and illuminating gift edition that will be treasured by readers. Stimulating and helpful annotations appear in the book’s margins, offering information, definitions, and commentary. In his introduction, Bharat Tandon suggests several ways to approach the novel, enabling a larger appreciation of its central concerns and accomplishments. Appearing throughout the book are many illustrations, often in color, which help the reader to better picture the Regency-era world that serves as the stage for Emma’s matchmaking adventures. Whether explaining the intricacies of early nineteenth-century dinner etiquette or speculating on Highbury’s deliberately imprecise geographic locations, Tandon serves as a delightful and entertaining guide. For those coming to the novel for the first time or those returning to it, this volume offers a valuable portal to Austen’s world. Bharat Tandon is Lecturer in the School of Literature, Drama, and Creative Writing at the University of East Anglia and the author of Jane Austen and the Morality of Conversation. The good folks at Harvard University Press are offering a giveaway chance for one of three copies available of Emma: An Annotated Edition, by Jane Austen, edited by Bharat Tandon. To qualify, tell us what you love or hate about Austen’s most troublesome creature, Emma Woodhouse. If you have not had the pleasure of reading Emma yet, tell us what entices YOU into reading the novel? Contest open until 11:59 pm Pacific time, Wednesday, September 26, 2012. Winners will be announced on Thursday, September 27, 2012. Shipment to US addresses only. Good luck to all! Ooooh, thanks for sharing. I love Emma! Being bestowed with the name Emma myself, I’ve always had affection for Jane’s most troublesome creature. The similarities between myself and her don’t end with her name, time and time again as I have grown up and reread and re-watched various versions of Emma I have found a kindred spirit in her. I personally believe that Emma is Jane’s best work especially with character development and description. The relationship between Emma and Knightly is something that I believe is more true and real then the love between Darcy and Elizabeth (Not that I don’t love Darcy and Elizabeth’s story). The way Knightly and Emma question each other and push each other into growth is Jane’s writing at it’s best. Despite Emma’s many flaws you cannot help love her. For, though at times, she hurts those around her it is never with malicious intent. Emma has the biggest heart of all Jane’s characters. I have never read Emma, yet, though that is one I seriously want to. While I’ve not read the book, from the films I gather that one of Emma’s best qualities is that she wants everyone to be happy. She wants true love matches and she really does care about the people that surround her, even if her intentions get the better of her. She’s a darling girl and definitely needs her Mr. Knightly to keep her in check. I love Emma’s care for her father but I dislike her meddlesomeness (though, of course, there wouldn’t be much of a story if it weren’t for that). I just wouldn’t want her anywhere near my love life. I love the certainty of the love between Emma and Knightly, and that he sees the good intentions, the flaws, the deep love for family, and knows who she is and who she can be. He never asks her to abandon everything but embraces her life when asking her to share his as well. Can’t wait to read this – I loved P & P and Persuasion – in fact, I’ve been recently drooling on – er – perusing my copy of Persuasion this week. I would love to win a copy – but one way or another, I’ll have one. Much as I love my kindle, this is something that must be savored in paper! I like Emma’s relationship with her father, too. Despite provocations she always treat him with respect; she may “manage” him but she never once rolls her eyes, not even in her mind. Also, I am very curious about Wm Larkins. I think someone needs to write a book about him. He’s so *present* in the novel, and yet we never meet him! I like that she found love right before her eyes but that it took a little growing up and awareness of her faults to realize it. “Emma” is fourth on my list of favorites, behind P&P, S&S, and Persuasion. Emma is so annoying because she is completely oblivious to real situations and relationships staring her in the face. She means well, but she needs another hobby. She is definitely one of Jane Austen’s best flawed characters! I like the “inside” look at the social mores of the time, certainly very different from today. However, Emma is such a classic portrait of a “teen age know-it-all!” As a long time English teacher, I had at least one “Emma” every year! Austen was able to both comment on her times and also the universality of societies throughout time. I’ve been wanting to re-read Emma, so I would love to read this annotated version :-) I love Emma because even though she is in everybody’s business and thinks she knows everything, she means well! Honestly it has been so long time, it is time for a re-read. Wow! I love Emma so much and I’m sure that the annotated edition will be the perfect addition to my collection. Emma is such a fun character because she sees what everyone else needs but can’t see what she herself wants. Very excited to see an annotated version! I believe that Emma truly meant well and wanted to see her friend happy and settled. She was definitely oblivious and maybe selfish too at times. I love her and Knightley’s relationship – I love that they were best friends who fell in love. Such a wonderful read! I have read and loved the other annotated versions. I love all the extra details; they really make the story come alive. Hope I win this one! When I first began reading Jane’s works Ive thought Emma was stuck up and nosy. As the years went on, especially after seeing the recent BBC production of Emma, Ive warmed up to her. I love the annotated versions since they give more insight, info, and examples on what life was like in Regency England. I love Emma for her flaws–she’s so real and so human–so easy to relate to! Thanks to this blog and Santa, I have the P&P version of this series…and I would love to add Emma! What I love about Emma is the way in which she develops and changes throughout the novel. She is by no means a perfect character, and thank goodness for that or no one would want to read about her! Through her various mishaps and encounters with other characters, especially Mr. Knightley, she begins to see herself in a new light. She begins to examine herself and her actions, and valiantly works at bettering herself. She grows from a girl who is often thoughtless and selfish to a woman who truly seeks the comfort and advancement of those around her. She is humbled by her errors and poor judgment, and strengthened by her admittance and repentence of where she went wrong. I also love Mr. Knightley’s love for Emma. While others admire Emma for her looks, her wit, and her charm, he sees past all the extraneous details into the real depth and value of her character: the love for her family and all those dear to her, her ability to take his criticism and be the better for it, her strength of mind and determination. He loves her despite her flaws, while most of the other characters in the story don’t even see them. It’s a beautiful story with amazing depth and insight into the cockles of the human heart, but of course, it’s Austen, so one wouldn’t expect anything less! Gee, I wish I’d have said all that! Emma’s attractiveness beautifully explained. Having just finished Emma, I must say that I can’t decide whether it like it, P&P, or Persuasion best. There were times I wanted to slap Emma silly and shake my head in disappointment, but I couldn’t help loving her for her naivety, innocence, and good intentions. I would love to check out the annotated edition. I love that Emma is a flawed person, a bit of a snob, but I still feel drawn to like her. I also get a chuckle out of her surname, as my husband’s “pet name” for me is “Woodhouse”, a derivation of my maiden name, an old college nickname. I’m so excited about this annotated edition– I might feel faint if I’m able to get a copy. Thanks for the giveaway! seeing her find love with wonderful Mr. Knightley,who has been right there all along. I have a love/hate relationship with Emma the book mainly due to to Emma the character. In the first half of the book during the whole “Let’s ruin Harriet’s love life by trying to pair her with Mr. Elton” I kinda want to slap her. But I love Mr. Knightley, and the once you get past the Harriet/Mr. Elton part the book isn’t bad. I guess I find Emma’s foibles a bit irritating at times, but I’m willing to tolerate them for the secondary characters. Emma is absolutely oblivious about what is going on around her. The reader knows that she is going to cause a train wreck, but can’t stop reading because he/ she needs to find out just how bad the wreck is and how it will be cleaned up afterward. The most painful moment in the book for me is the comment Emma makes about Miss Bates at the picnic. I hated Emma for not realizing her thoughtlessness really hurt her friend. She does learn from the incident and thats what makes me love her in the end. What I hate about Emma: she thinks she knows best for everyone and is judgmental of poor Miss Bates. what I love about Emma: she truly does love her family and was willing to give up her engagement to Mr Knightley for the sake of her father; she was willing to humbly accept correction from Mr Knightley regarding her comment about Miss Bates. I love Emma because, of all of Austen’s heroines, she is the one that grows and evolves the most. Emma has a special place in my heart because it was my entrance into the wonderful world of Jane Austen. Unlike many readers, I was drawn to love Emma almost immediately. Sure she was spoiled, manipulative, and misguided. BUT what a “diamond-in-the-rough! Beneath all of that beat the intelligant heart of kindness, loyalty, and tremendous potential for benevolant communnity leadership. What a generous pair her and Mr. Knightly would make, not only for each other but for everyone in Highbury. I don’t really hate anything about Emma except that I am a bit annoyed by her snobbishness when it comes to people she feels are not her social equal. What I love about her is that she is a good daughter and a good and loyal friend. Even if misguided, she does what she does in the best interests of those she loves. Emma is my favorite Jane Austen novel and my favorite heroine by Jane Austen. Her easily distracted nature, combined with the ability to focus intensely on things for a short time (sitting down at the piano and playing for an hour in memory of her poor performance), her bossiness, her energy – all of these remind me of myself or what I hope to be. But I think what I love most about Emma is that she’s so self-determined. Mr. Knightley may point the way to a better self, but it is Emma who finally determines that this is the right direction, and firmly sets herself on that path. I love Emma’s sense of humor and her ability to admit that she was wrong and to change. Emma is one hard girl to like,but after a few rereads,she does grow on you. The best film adaptations of Emma are,in my opinion,the Kate Beckinsale version(with Mark Strong as the ideal Mr.Knightley! )and Clueless,which holds up rather well thanks to it’s Austen connection. I happen to be reading All Roads Lead to Austen,where the author is conducting a series of Jane Austen discussions in Latin America and one of the books chosen for this journey is Emma. It is amusing to see just how troublesome others find Miss Woodhouse all over the world and yet,do see her merits as well. I haven’t read Emma since high school. And I didn’t like it then, so haven’t picked it up since. But, I’ve been thinking I needed to try it again-after all JANE AUSTEN wrote it!!!! I read the annotated version of Persuasion this spring and loved it! Thanks for the opportunity to win!! I think Emma is my favorite Jane Austen novel. It may be because it happens to be the one I’m currently reading. Emma is a frustrating character, but it’s nice to be able to see the transformation she makes, especially in relation to herself and what she really wants. It’s a great read. And I’m excited about the annotated edition! I love Emma! I think she’s a great mix of naive, stupidity, meddlesomeness and her match making schemes are quite comical. I think we can all find a little bit of Emma in someone we know. She’s not quite likeable in the beginning, but somehow she grows on you through the course of the story. One of the things that I like about Emma is how oblivious she is for someone trying to play matchmaker. How she misinterprets every detail of interaction to point in one direction, and completely missing how it all actually points another is always amusing. Having the Annotated Persuasion, I can’t wait to get my hands on the Annotated Emma! I love Emma (& Mr Knightley)…it is one of my favorite Austens….the character development just rings true to me…P & P seems more of a fairy tale ( though I love the happy ending) Emma is a sheltered, pampered young lady who grows up into a spirited young woman…she even helps Mr Knightley grow alittle himself in the end…. I love Emma because of all of Miss Austen’s characters I think Emma discovers the most about herself as the novel progresses. We all have some of Emma in us. Sumptuous indeed! What a visual feast! I’m so happy Harvard University Press is publishing so many of these elegant and informative editions of Jane Austen’s novels! Something I love about Emma would be here wit! She’s got a sharp sense of humor (sometimes it isn’t always kindly meant), but she could definitely keep up with Elizabeth Bennet! Emma is loyal to her friends, and wholly devoted to her invalid father. She is delightfully written by Jane Austen, but far from my favorite character. I do love the book though- I’m a Jane Fairfax fan! Emma was for a long time my second favorite Austen novel, until I re-read it 2 years ago, then it got the first spot. I love it mostly because its humor, it really makes me smile and laugh. I don’t like Emma’s schemes for ‘managing’ others people lives, but I think that she mostly does it out of good intention and not because she wants to do harm. I also think she really lives a very boring life (even for that time’s standards). As for Mr.Knightly, I never pay him much attention to him or the romance in the novel, I mostly like it for other reasons, but again after some re-readings he IS my Austen man. I really love Mr. Knightley and Emma’s relationship. They can tell each other the way it is and still love each other.